The regulation of gene expression by nutrients is an important mechanism governing energy storage and growth in most animals, including fish. At present, very few genes that regulate intermediary metabolism have been identified in barramundi, nor is there any understanding of their nutritional regulation. In this study, a partial barramundi liver transcriptome was assembled from next-generation sequencing data and published barramundi EST sequences. A large number of putative metabolism genes were identified in barramundi, and the changes in the expression of 24 key metabolic regulators of nutritional pathways were investigated in barramundi liver over a time series immediately after a meal of a nutritionally optimised diet for this species. Plasma glucose and free amino acid levels showed a mild postprandial elevation which peaked 2 h after feeding, and had returned to basal levels within 4 or 8 h, respectively. Significant activation or repression of metabolic nuclear receptor regulator genes were observed, in combination with activation of glycolytic and lipogenic pathways, repression of the final step of gluconeogenesis and activation of the Akt-mTOR pathway. Strong correlations were identified between a number of different metabolic genes, and the coordinated co-regulation of these genes may underlie the ability of this fish to utilise dietary nutrients. 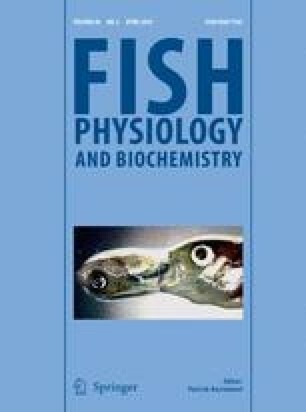 Overall, these data clearly demonstrate a number of unique postprandial responses in barramundi compared with other fish species and provide a critical step in defining the response to different dietary nutrient sources. The online version of this article (doi: 10.1007/s10695-013-9854-y) contains supplementary material, which is available to authorized users. This work was supported by a grant from the Australian Centre for International Agricultural Research (ACIAR) project FIS-2006-141. We gratefully acknowledge the review of a draft of this manuscript by Katherine Morton.